When I am asked what my favorite poker variant on the planet is, I usually like to think a bit before giving an answer. This is because I try to expose myself to as many different options as possible, constantly seeking new information about each type of game. Poker is unique in that it so easily adapts itself to a wide range of variations. This is part of what makes the allure of the game so timeless. It is impossible for me to choose one particular poker variant and claim it is my absolute favorite. Instead, I would have to comprise a list, but one which would be open to change every now and then to fit my passing moods. If all this sounds like a cop out, that’s because it is. So let me make one clear statement and say that Caribbean Stud would have to be near the top of my list. It’s an outstanding and largely overlooked game. Each player and the dealer then get five cards, face down. 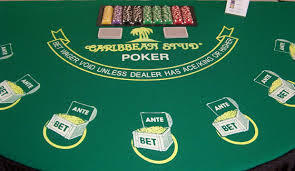 The dealer will turn over one of his cards, then push the cards toward the players, after which the players may look at their cards. All players have two options – to play or fold. If the choice is to play, bets are placed (which is an amount exactly twice their respective ante) in the bet box. Folding the hand will lose their ante. When all the players have made their calls, the dealer exposes his hole cards. This is a game which places a high premium on proper etiquette, so it’s worth your time to figure out some very basic rules of decorum. There is only one hand allowed per player. Players cannot hold or wager on multiple hands at the table. If the dealer does not show an ace/king, hands playing the jackpot must be turned over, face up, and shown to the dealer and table. If the player is not playing the jackpot prize, the cards are not shown. This may seem a bit odd if you are used to playing different forms of poker, but it’s important. Knowledge of what other players hold can decrease the house edge. It’s estimated with the knowledge of 6 other player’s hands, the player can gain an edge of 2.3 percent. That’s a fairly substantial difference. Since sharing information is against the rules, a computer would be needed to calculate the appropriate strategy. I would not hold your breath for that to ever happen in a casino, my friend. But we can all dream.